Instantly add an element of distinction to any office environment. 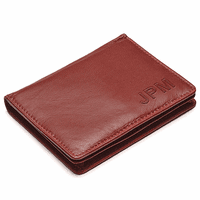 All it takes is this deluxe card holder and an available desktop. The sturdy wooden base has a rich mahogany finish like the one found on the grandest pianos. 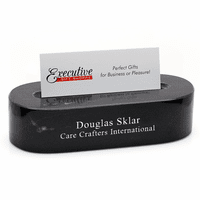 Polished gold tone support columns hold up to fifteen business cards. 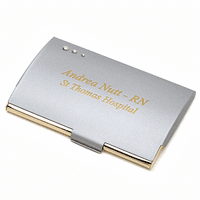 There's a polished gold engraving plate where we can add a name or a short message free of charge. Your gift usually ships the next business day and arrives at a home or workplace in an attractive gift box. Dimensions: 5 1/8" x 2 7/8?" x 2"
I'd like the Army logo on this along with my son's name/title. Can you do that? Yes, just let us know in the comments section of the checkout page exactly what you would like engraved on it. If we have any questions, we'll call or email you immediately. Thank you and thanks to your son for his service. 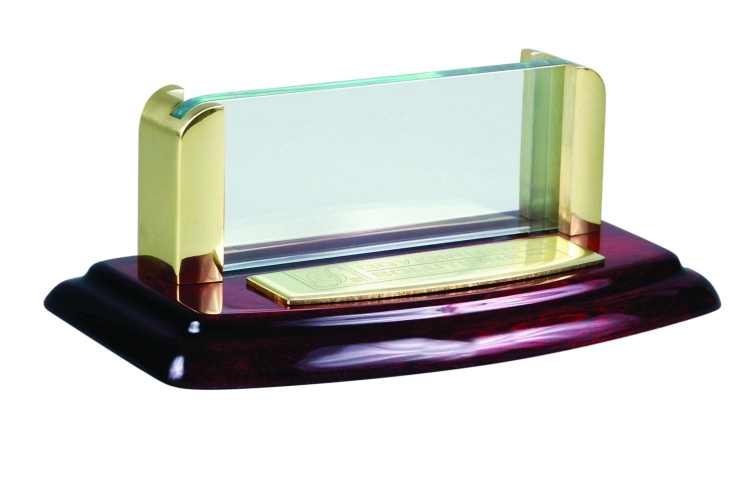 We would like to order the Piano Finish Desktop Business Card Holder. We would like our logo engraved on it. 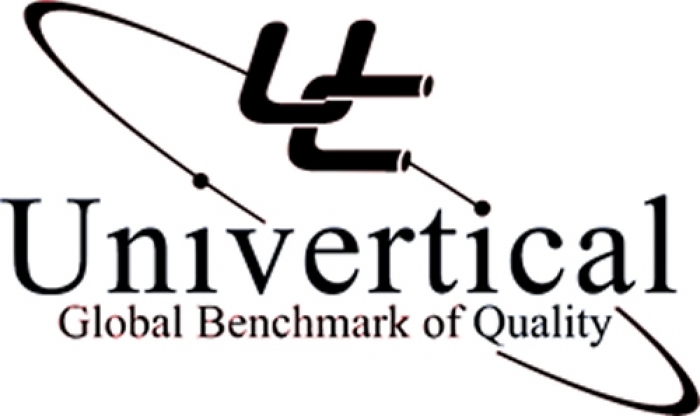 I have attached our logo. Can you help with this? I do not see a spot on the item page to upload an image to engrave...only text. Thank you! Shopping was easy, shipping was fast! Engraving looked perfect. The reason for the 4 stars and not 5, the bottom says MADE IN CHINA. 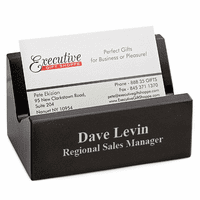 Beautiful Business Card Holder ! This was a gift for my son. He loves it ! It looks much more expensive than it is I received it two days after I ordered it. I was pleasntly surprised with the quality of the gift, which surpassed the description, the free engraving and the quick arrival! I bought this card holder for my manager and had it personalized with his name. The wood and gold are beautiful and professional and will look great on his desk. 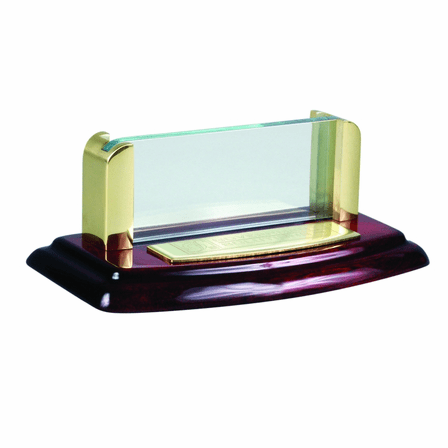 Classy item and very professional for any desk. I purchased one for each of the two attorneys in my office. They are attractive, look very professional and arrived quickly. I highly recommend! I was very pleased with this product. I gave it as a gift. The recipient was very happy with it. This was a perfect gift for my boss and it looked beautiful. He loved it and immediately placed it on his desk.